I'm a big fan of ioSafe. The company makes products that are, frankly, scary kind of good. After taking a look at some of the online videos of the products being burned, drowned, etc and still surviving with data intact I have recommended and used their hard drives in my office & my home. Today, they've announced the newest model in their line of drives designed to survive disasters. Their products are highly recommended. The ioSafe® SoloPRO is available in high-performance USB 3.0 and eSATA versions, providing users with an unprecedented combination of speed and physical security. AUBURN, Calif., August 18, 2010 -- ioSafe today announced the availability of the SoloPRO. The SoloPRO is the business-class edition of the award-winning Solo external hard drive and is available in USB 3.0 and eSATA/USB 2.0 formats, providing full support for Windows, Linux servers, and desktop operating systems. Fast transfer speeds over 100 MB/s - 3 to 4 times faster than typical USB 2.0 speeds. One TB of data can be backed up to a SoloPRO in a couple of hours versus 10+ hours with USB 2.0 or several months online at normal speeds. Available in 1 TB, 1.5 TB and 2 TB capacities. Rugged disaster proof design. Both the USB 3.0 and eSATA versions of the SoloPRO protect against data loss in temperatures up to 1550° F for 30 minutes per ASTM E119 or being submerged to a depth of 10 feet for up to 3 days. Advanced Replacement Service. Replacement products under warranty will be shipped out in advance with proper packaging and return shipping pre-paid. The end user simply uses the packaging to ship the original unit back to the factory. 12 months Data Recovery Service Standard. Up to $2,500.00 towards the cost of third- party forensic data recovery, one time, for any reason including accidental deletion, hard drive failure, fires, floods, etc. Upgradeable to 3 or 5 years for $49 or $99 respectively. Heat-resistant paint option. Bright emergency orange colored coating to help make the SoloPRO easy to recover in a post-disaster environment. “Both homes and businesses need to store ever-increasing volumes of data quickly without worrying about data loss. ioSafe has always been about safely and securely storing data locally and now with its introduction of USB 3.0 and eSATA, homes and businesses can accomplish that more quickly than ever before ," said Jerome Wendt, an expert in data storage who serves as the Principal and Lead Analyst at DCIG. Martin A. Regtien, Editor-in-Chief of Digital Reviews Network, tested the SoloPRO and said, "Based on the ioSafe SoloPRO USB 3.0 strengths – in this case its literal strengths of being fireproof, waterproof - plus its value for money, we have no option but to award it our highest commendation: our Editor’s Choice Award." 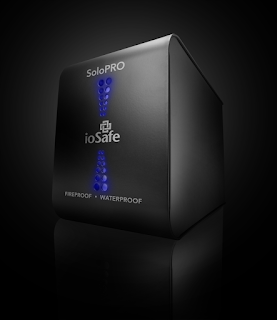 ioSafe CEO Robb Moore added, "The new SoloPRO provides industry-leading performance and physical security as well as plug-and-play simplicity. Additionally, the new interfaces and upgraded Data Recovery Services make the SoloPRO a logical choice for disaster protection in home office and business environments." The USB 3.0 Solo is compatible with USB 2.0. Users without USB 3.0 who wish to upgrade can easily do so by adding a USB 3.0 PCI Express card to their system. Priced at $249.99 for the 1 TB model, $319.99 for the 1.5 TB model and $419.99 for the 2 TB model, the SoloPRO will be available September 1, 2010 via the ioSafe website, resellers and international distributors. Like an aircraft black box for data, ioSafe provides rugged, fireproof, waterproof hardware and disaster recovery services as a cost-effective way for corporations and consumers alike to protect their irreplaceable data. ioSafe is a privately held company with headquarters in Auburn, Calif. For more information, please visit www.iosafe.com .